If you're a big fan of the markets, here's pretty much all the info you need to discover some new places to check out. Whether you're keen to to get your hands on unique handmade jewellery, stuff for kids or the freshest fruit and veg, read on. This one rotates between Belmont, South Fremantle and Warwick. It's great for parents who are looking for pre-loved baby stuff - whether it's the big things like prams and cots or the little things like outfits and booties. Check out the dates here. On Sundays this is Perth's largest undercover market with room for 300 stalls. It's from 7am - 2pm on Bannister Road and you'll find new and second hand goods here. Toys, kitchen stuff. clothes plus fruit and veg. You'll find these markets in East Perth at 1 City Farm Place. There's a great community/organic vibe and the Artisan Markets happen on the fourth Saturday of the month from 9am - 1pm. Lots of handmade stuff here from body products to wood features. Enjoy the live music and an organic tea or coffee. They say they're the only market in WA that has certified Organic & Biodynamic stall holders. Pick up your organic eggs, oil, meat and dairy every Saturday between 8am - noon. These ones are inside near the Morley Galleria on Walter Road. You can pick up fresh fruit and veg and pick up deli goods, seafood, meat and wine. Have a massage or check out the homewares and junk stores. Open seven days from 8am - 6pm. These ones are located on the wharf in Fremantle. A little bit junky too! They're open Friday to Sunday, plus public holidays from 9am - 5.30pm and the food court stays open till 8pm. High quality fruit and veg. It's on every Sunday from 8am - noon at the front of South Fremantle Senior High School in Beaconsfield. You can also get hot food and fair trade coffee. Everything from fresh fruit and veg to fridge magnets and jewellery. Good if you're after a uniquely WA gift. There's also seafood, coffee, sunnies, clothes and pottery. And they have a market bar. Freo markets are on the corner of South Terrace and Henderson Street and open Friday 9am - 9pm, Saturday 9am - 5pm and Sunday/public holidays 10am - 5pm. Unique handmade markets that are open from 9am - 3pm on the third Sunday of the month from February to November in and around the historical Guildford Town Hall. Worth taking a drive to. These are great. You'll see jewellery, crafts, jams and art pieces. In the Kalamunda Town Square on the first Saturday of the month between 8:30am - 3:30pm. So many stalls and highly recommended. Check them out in Malaga on the corner of Alexander Drive and Beach Road. Fruit and veg, a food court and lots of stuff to look at from fashion to toys, pet stuff to coffee beans. Open Friday to Sunday plus public holidays from 9am - 6pm and the food court stays open till 9pm. They say handmade, boutique and unique all come together at these markets. Retailers have to apply to sell their goods here and the Market Girl team guarantee what you'll find it high quality, unique and affordable. When's it on next? Click here. Another one for parents. The sellers are handpicked to be involved and products range from kids pj's to birthday cards, wooden toys and fairy dress-ups. Get the date for the next market here. 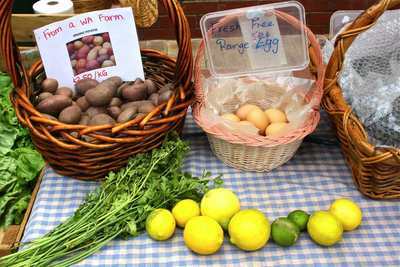 Grab your fresh fruit and veg every Sunday from 7am - 3pm. The market is on Old Great Northern Highway, behind Town Hall clock in Midland. You can also pick up beautiful flowers and enjoy a sausage sizzle. These markets are in Bassendean at the intersection of Guildford and Old Perth roads, right near the train station, and happen on the last Sunday of the month. From April to October the hours are 9am - 2.30pm and from November to March they're open 8am - 1pm. The markets boast produce and crafts from the local area. You can enjoy some live music too. Perth designers have to write proposals to be selected to show their stuff at Upmarket. Funky jewellery, kids clothes, art and handmade chocolates. It happens quarterly at in Nedlands at UWA's Winthrop Hall. Make sure you check this one out! Get the dates here. They also have a special wedding themed market. You'll always get great fruit and veg here. Plus there's a small selection of goods like hats and jewellery. You can pick up beautiful fresh flowers and have something to eat - sushi, Indian food or bakery goods. It's open from 9am - 5.30pm on Friday - Sunday and Monday public holidays. Fresh, fresh, fresh fruit and veg every Saturday from 8am - 12.30pm at Subiaco Primary School on Bagot Road. It's a not-for-profit market and funds go back into the school. Pick up your fresh bread, yoghurt and eggs to and let your kids enjoy the entertainment. On Prindiville Drive in Wangara and open every Friday to Sunday plus public holidays from 9am - 5pm. The food court and bar is also open Wednesday to Sunday. Fresh produce plus jewellery, socks and even a hair salon. The Canning Bridge Arts Markets are held on the first Sunday of every month (except January) from 9 am to 2 pm. The Markets are located on Kishorn Rd in Applecross between 1st St and Moreau Mews. Access the Markets from Canning Hwy & Kintail Rd or Canning Hwy & Sleat Rd. Station Street markets at Subiaco are closed. Midland markets no longer close at 3. Local & General Markets are popping up more now days too! Don't forget Poynter Farmers Market in Duncraig! Held every fortnight on Saturdays at Poynter Primary School. Be early, it's popular! Found another one - The Stirling Farmers market - Sunday morning on Cedric Street at the Council carpark. Mt Claremont Primary School Growers Market, every Saturday morning. Its great! No mention of the Gosnells Railway Markets ? Subiaco and Claremont Farmers market are also good. There is a big one coming up at Tennis Centre behind Burswood. Many of these markets are not for profit and are well supported by locals who are seeking alternative and relaxing shopping experiences.